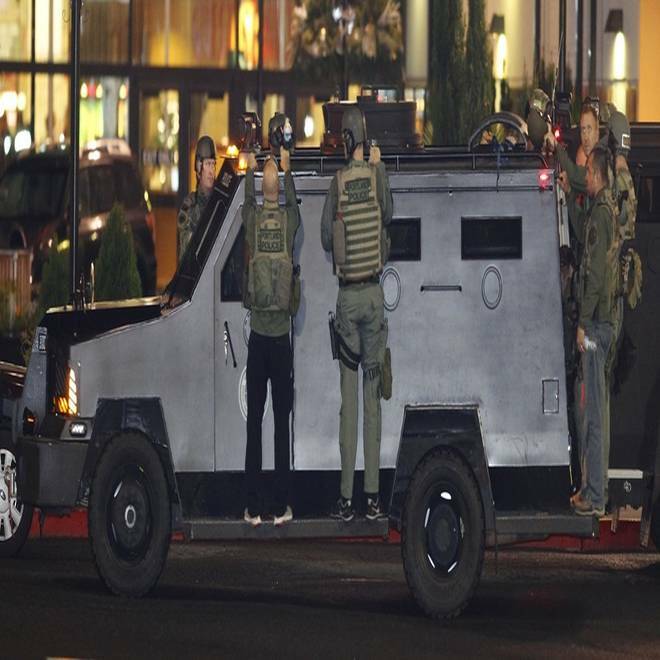 Police move with an armored vehicle at the Clackamas Town Center shopping mall near Portland, Ore., on Tuesday. The sheriff says officers arrived at the shooting scene about a minute after the initial 911 call. A gunman wielding a stolen semi-automatic rifle and several fully loaded magazines opens fire inside a shopping mall teeming with as many as 10,000 people. Yet, only two people are killed and one wounded. Sheer luck, or were authorities and mall officials well-prepared? Probably a bit of both, say law enforcement and security experts, some of whom credit new police tactics and better security training at schools and public venues for helping to minimize the casualties at the Clackamas Town Center near Portland, Ore.
"I want to say that we were … well-prepared for this incident because we had practice in active shooter techniques at the Clackamas Town Center this past year for this type of situation," Clackamas County Sheriff Craig Roberts said at a news conference Wednesday. It's not known what prompted the Tuesday afternoon attack. The sheriff said only that the shooter, identified as Jacob Tyler Roberts, 22, of Portland, appeared to be on "a mission" to kill. But he added that the first officers arrived about one minute after the first 911 calls and immediately separated into teams to head into the mall. Jacob Tyler Roberts is suspected of killing two people at an Oregon shopping mall. NBC's Jay Gray reports. "Law enforcement has learned from past tragedies throughout this country that we can't wait for SWAT teams, and teams need to deploy immediately," Roberts said. "So we trained and equipped each of our individual officers to form up in teams as they arrive and move immediately into engaging the threat, wherever it might be." That's a tactic that many law enforcement agencies began instituting in the aftermath of the April 1999 massacre at Columbine High School, where two young gunmen, Eric Harris and Dylan Klebold, shot to death 12 students and a teacher and injured 21 others before killing themselves. At Columbine, law enforcement followed traditional tactics of surrounding the building and waiting for more heavily armed units to arrive. Crucial minutes ticked away, during which Harris and Klebold killed and wounded more people. Many agencies now train their officers to go after an "active shooter" immediately rather than wait for tactical squads. That rapid-deployment response is exactly what happened in the mass shooting at an Aurora, Colo., theater on July 12 that left a dozen people dead. Aurora police got the first call at 12:39 a.m. Seven minutes later, suspect James Eagan Holmes was arrested. "Ever since Columbine, there's been a paradigm shift," said Mark Lomax, executive director of the National Tactical Officers Association. "In the past, it was the standard protocol if there was a shooting incident or a barricade suspect or a hostage situation, the first responder would secure and contain the crime situation until the SWAT team or negotiators or bomb techs would arrive." School shootings highlighted a need to teach first responders to handle situations before those specialized units' arrival, Lomax said. "It takes a while for a fully equipped SWAT team or hostage negotiation team to get to the scene. We've realized over many sad incidents that time is of the essence when it comes to saving lives and that those first responders should be fully knowledgeable with how to handle those situations. They won't be the experts, but they need to have enough training and equipment to do exactly what they did in Portland," he said. Sgt. A.J. DeAndrea of the Arvada (Colo.) Police Department, who was among the elite team members who searched Columbine High the day of the shooting, says the tactic of going after shooters immediately has helped save lives. He told The Denver Post the first SWAT team didn't even enter Columbine until 38 minutes after the first call. "There are times when you cannot wait. It's an inherently risky job. Our job is to go in and protect innocent lives," he told The Denver Post in an interview earlier this year. The Clackamas Town Center mall general manager Dennis Curtis says the mall had an emergency plan in place and regularly holds emergency drills. Watch entire comments. Many malls and other public venues now routinely practice responses to emergencies like the one that unfolded Tuesday in Oregon. Clackamas Town Center has a lockdown procedure in place. "Every mall that we own and manage has an emergency response manual and we rehearse for these things all the time. We go through those emergency response plans on a regular basis. We've done drills with the sheriff's office," said the mall's general manager, Dennis Curtis. "Basically, in a situation like this it's either stay right where you're at and lock yourself down or get to the nearest exit and get out of the building. I just have to commend all of the retailers and our security staff. They did an amazing job." Sheriff Roberts noted that the gunman's rifle jammed at some point, and that stroke of luck may also have saved some lives. He also said a large number of police officers arrived on the scene very rapidly, curtailing the suspect's ability to move around the mall. Lomax said police departments across the country have been training for "active shooter" situations so they, too, can take down a suspect who has a weapon in a public area rather than waiting for backup or a tactical squad. "I believe that there are a lot of departments that are being very proactive on this type of training and equipping their patrol officers with automatic weapons and ballistic vests and shields to address these types of things," he said. "It only takes a matter of minutes to do a lot of mayhem out there, and these sheriffs and police chiefs understand that they need a very equipped and trained front line whenever it comes."